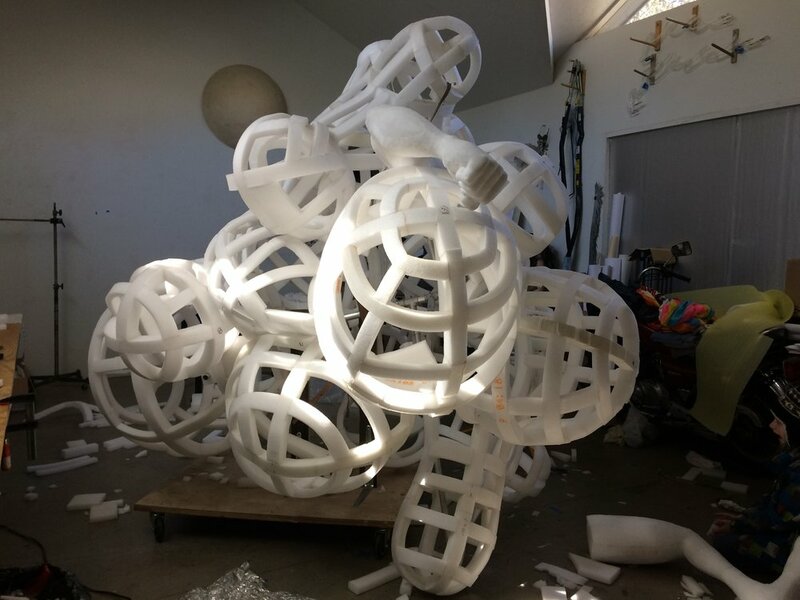 MAC @ IAS is pleased to present a new sculpture, "Maelstrom Analytica", by Tristin Lowe. Tristin Lowe is a multi-disciplinary artist whose practice delves into the crude and rude, absurd and abject - pushing low-brow, low-tech methods and materials toward unexpected ends. The artist makes drawings from grease paint and fire, uses edible materials such as butter, chocolate and alcohol to make hilarious and sad installations (beds that wet themselves, pillows that smoke), and handcrafted exquisite reproductions of both animate and inanimate objects (an upended trashcan sewn from felt, a mangy, fake-fur fox, a two-story folding chair). Lowe's wry re-imaginings lead the viewer down a path littered with chaos, comedy, and failure. For this exhibition, Lowe has drawn inspiration from cartoonish depictions of brawls. The cloud of fists and feet - literally a "dust-up" - is a commonly used comedic shorthand for conflict. Lowe uses this trope to explore masculine aggression, blowing the Cloud of Violence to larger than life proportions. The limbs belong to giants engaged in battle; but the reference points we have for viewing this work are rooted in a brand of humor that undermines the rationale for violence. We know from prior examples in popular culture that the outcome of any such "dust-up" will be humiliating at the least, and possibly absurd. The rules of humor suggest that we cannot even expect there to be more than one combatant within the Cloud - the protagonist may be fighting only himself. The Fabric Workshop and Museum Residency, and Girard College Residency. He was co-founder and co-director of the non-profit gallery Blohard. Lowe’s work is in the collection of the Philadelphia Museum of Art, The Pennsylvania Academy of the Fine Arts, and The West Collection, as well as numerous private collections. Tristin Lowe is represented by Fleisher-Ollman Gallery in Philadelphia.